Pinal Dave is a popular blogger and if you follow any number of blogs, you’ve most likely heard of him. Pinal Dave’s blog Journey to SQL Authority (SQLAuthority.com), has the highest traffic of any SQL Server Blogger and the third most traffic for any site dedicated to SQL Server (after SQLTeam.com and SqlServerCentral.com). Recently, Pinal was kind enough to agree to answer some questions for an interview. It’s been a fun process and I’m happy to present the results of the interview here. Although he doesn’t know this, I’ve actually met Pinal Dave. It was at the SQL Server Summit 2009 and I was running between one session or another and I sat down to check email. Pinal was in a seat nearby talking with some colleagues of his and I recognized him. I chose not to introduce myself because he seemed busy at the time. I kind of regret that now. Some day I’ll get the chance to introduce myself in person. But meanwhile, we’ve exchanged messages through our blogs and email messages. He was good enough to submit an article on indexes when I hosted TSQL Tuesday in September last year. I hope you enjoy this interview. I think (and hope) you’ll find it fascinating. A. This is great question. People from India usually pronounce my name correctly. However, every time I travel internationally, I have issues. The way to pronounce my name is ‘Pinul Daway’. However, it is spelled ‘Pinal Dave’. Every time I travel to Canada, the USA or other English-speaking countries, people often call me ‘Dave’ – thinking that is my first name. However, Pinal is my first name and Dave is my last name. Very interesting question indeed. I always wanted to clarify that on my blog but never got chance. Q. Tell me where you grew up and where you went to school. A. I can give you the names of the places and schools but it will not make sense. My father had a government job and he had to transfer from location to location. This meant I changed schools quite often. I cannot name one city as the place I grew up. I changed schools 12 times before I entered grade 12, I think that says it all. Q. Tell me about your family. I believe you’re a husband and a father? A. I have a beautiful daughter, Shaivi, and a lovely supportive wife, Nupur. Everybody has an interesting story about how they met their wife or life partner. I have interesting story about how we did not get introduced for long time. Our homes were very close to each other. We have many common relatives and friends. But for almost 25+ years neither of us ever met each other. However, I had met her whole rest of the family (father, mother, sister, grandparents, etc) hundreds of times. Well, the same thing goes for her. She had met my family but not me. We were finally introduced to each other by our parents and it was love at first sight. … and then there is Shaivi. She is now everything for us. This morning for the first time she said the word that I always wanted to hear – “Daddy.” I am overwhelmed with emotions. My top two favorite memories are already mentioned in the earlier questions. The day I met my wife. I guess nothing can top those two moments. Q. Your blog SQLAuthority.com is very popular. Why is that? A. If I am polite and say I do not know or give you some kind of philosophy, it will not be the truth. I personally believe there are two reasons. English – English is not my first language, which limits me to writing everything in the 500 English words I know. I think there are plenty of readers all over the world who are in the same boat as me. Simplicity – I try to make complex subjects simple enough for even beginners to understand. We are all beginners at one point. I believe that the smartest guy is also a beginner in a new subject. I strongly believe that we all are beginners but the only difference is we all have different powers of understanding. Q. You have written so many articles. With training and other events,when do you find time to write? A. It is difficult – very difficult- extremely difficult! I have to ration my time. I sometimes feel guilty when I ration time away from my daughter. I promise I will not do that today. Q. Your blog is written in English. Why is that? Do you also train in English? Now I do training in English and I write in English. The reason I write in English is because I learned SQL in English only. I still think in my local language and then quickly translate it to English. The reason I prefer English is because I believe English is a Global Language and if I want to help the global community, I must express myself in English. Q. Who has helped you the most with your successes? How have they helped? A. As this question is in a SQLAuthority.com section I understand you are asking this question in a professional aspect. Ben Forta – He is an Adobe Evangelist and I learned a lot reading his blog and books in my early career. I always wanted to be Evangelist like him. I think I want to give him complete credit for inspiring me to write a technical blog. Vinod Kumar – He is an MCT-Technology Specialist in Bangalore, India. He was an SQL Server Evangelist from the inception of the program in India. After coming back to India, I read his blog and always wanted to be like him – helping the community become more technology aware. Rushabh Mehta – He is Solid Quality India CEO and world famous BI expert. He is one man, who have given me chance – chance to prove myself, chance to grow, chance to learn technology, chance to help community, chance to go to next level and many more. I own a lot to him. Rajendra Dave – He is my father. He reads each of my blogs and gives me his feedback. He always encourages me to write creatively and constructively. He has one rule – “Praise in public, criticize in private.” I think this has helped me tremendously. Others have inspired me but he has put 100% of his efforts in making me successful. Q. You mention on your blog that you’ve been awarded the MVP award. How long have you held that distinction and how did it feel when you first won it? A. The MVP was the best thing in my life professionally. The feeling was that Microsoft is watching me and appreciating me. I felt – “Microsoft Cares.” It was great feeling. I have been holding this award for three years continuously. I think being an MVP is the best thing that can happen when one is dedicated to the community. The MVP award has enabled me to do lots of things. It has connected me with great peers and given me access to essential resources, which enabled me to help community further. Q. Besides blogging, consulting, training and family time, how else do you spend your time? A. I like to travel. I travel for consulting, training, the community, and for family vacations. Due to the nature of the job, I have to make a conscious effort to stay away from work many times. When I travel with my family, I make sure I do not keep computers around. I do not even check my email and spend 100% time dedicated to my family. They love it and I love them. Thank you again Pinal, I’m grateful that you took the time to answer my questions. Great interview, and I love how the comic-style drawing works. Pinal’s a hell of a nice guy, too – you missed out not meeting him in person! He’s a gentleman. I am learning this very first time that I missed meeting Michael. I really wished I would have met him. You are also very kind Brent (the master). I really loved this interview – it made me tell story about how I (did not met) my wife (for long time) very first time. I would like to know like from where and how did you start your professional career and most memorable challanges you have faced upto today, I am sure that your answer would inspire a lot to others to get proper direction. Nice… you are an inspiration to many people like me. Once again, your welcome Pinal, and once again thanks for your time. I feel like I got the better end of the deal here. I kept the bit about missing meeting you to myself on purpose as a small surprise. Brent, Falak, Suri, Thanks for the feedback. It was a great interview. The comic like pictures are really cool! Pinal, as always you are inspirational! 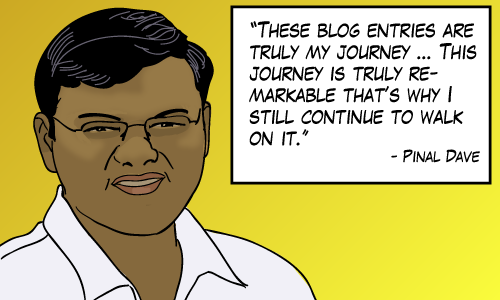 Hi Pinal, Its a great interview, especailly the comic feature…I would like to thankyou for making a great blog for our SQL Server world. I second those thoughts Phani! Neat interview! I still remember time you gave to us at Nepal. Keep in touch. Excellent article post. Thanks for letting us read a wonderful interview with a wonderful personality. I will be doing a face to face interview called “Uncut n Unedited” with Pinal. Trying to work out some dates with Pinal since he is in Bangalore now. very nice interview, and your story, really a big inspiration. give a loving endearment to shaivi. Thanks to Michael and Pinal(Pinalbhai as we call in respect in Gujarati, I share the same mother-tongue as Pinal Sir). Way to go Pinal! Enjoyed reading the interview. Nice set of questions Michael! Nice interview. Congratulations to Pinal Dave, who is definitely a nice guy. @Lohith, sounds fun, make sure to keep me updated when that’s available! Glenn, Suprotim, Sachin, Gandip, I’m glad you liked the interview. Thanks for this interview… I agree with all the others about Pinal being a “nice guy”, but that seems like such a gross understatement. I rank all nice guys I meet on a scale from 1 to Pinal. Many thanks for kind words! @Brent – you have been inspiration for blogging – You know how many time, I have sent you email with personal questions. @Dhananjay – just like Brent have mentored me – I am doing the same to you. Just passing the positiveness to you which I have received from the community. @Falak and @Suri and @Sachin Soni – Thank you very much. I do not think I have met you but would like to meet you for sure. @Pradip – you know that you have been our community star – people like you keep me more involved with community. @Phani – I know so many SQL Expert with this name – I am sure you are one of the same. @Lolith – today I have given video interview you to – thanks again. @Kunal – I know you from your blog so I can not say that I have not met you. You are our “Gujarati” Star. @Suprotim – You know the talk we had in bus in Goa. Those 30 mins you made me look within me. I was not sure where I am going but you help me draw my roadmap and here I am. Thank you my friend. @Glenn Berry Sir – I was standing in corner and you were the first one to call me in my very first MVP summit. I still think if you have not called me, I might be still standing in that corner. Thank you very much. @Brad Schulz Sir – You are very kind. I read your blog and you know how many times I have told you – you inspire me to keep the quality up. I use your work (with permission) in my blog, my work and everywhere. You help me buy me food everyday. I should thank you very much. @Paras – I know you and you are eager to learn. All the people who have commented on this post are Legend – if you can take one thing from them – you will be soon there. Best luck as you are entering the professional world. @Michael Swart – I do have proper words to write to you! Here is simple 2 words – Thank you! @John Samson – Thank you again for kind word. I quite often end up on your blog when I want to read something interesting. You have plethora of interesting insight in technology. Your recent link blog summary is awesome. Hours of reading. Thank you for doing it. @Gandip – I am writing this when I am chatting with you in skype. You have true potential to be IT Hero – just keep it up. You are jus there! Really a nice and realtime article and I really loved reading all the Q&Aa. Got the correct pronunciation of your name (Pinal Dave). I would also like to say thanks to you @Pinal for helping the global community and encouraging me to help in the same way, but still I’m a beginner and you an my Icon. Russia with You, Pinal! Keep it up! Your support to the Sql Server Community is highly appreciable. Your way of presenting topics and solutions are very understandable even for sql learners. We learned a lot of things from your blogs. Keep it up. Convey my best wishes to your family mebers. According to Hindu mythology , ‘Vidya Dan is Great in All Danas’. You are donating(transferring) your knowledge to others. Really Great. Keep it up. All the people said, what they believe about Pinal Dave like nice guy, gentlemen and e.t.c. But i think i am the only person who knows, how much kind he is, to help out beginners. Thanks for sparing your precious time to share with community. Nice caricature, great interview, thanks for sharing. Very inspirational answers, always get the positive energy while reading your stuff. You are helping new comers or beginners survive their first job. atleast this is the case with me and i bet with hunderds of others. I am into my 5th year of SQL Server DBA with all your help and knowledge you share with us. We as a community cannot ever pay back. Great, love Dave works and humility. Yes, Pinal is a Great guy. He is totally dedicated to educate people. His effort is surly appreciable. Both Pinal and Michael have been an ongoing resource and inspiration as I have been in this industry a little over 4 years now and feel like I am always a beginner. Pinal makes the complex topics both easy to understand and easy to internalize for later use. First of all U R AWESOME PINAL with ur knowledge n ur patency. coz generating time for dedicating to subject n at the same time helping ur family . Really well balancing Sir. U Inspired me vth ur all ur Experinces.I wish God grace will b there to u n ur cute family in all aspects. Great interview ! Nice work Michael! Pinal is down to earth ,simple and an inspiration to many people. Pinal is really a hero of SQL community and is always an inspiration for me. I wouldn’t had chance to work with Pinal, I wouldn’t be in community. 🙂 Thank You Pinal for everything….. This is saurin and i wan’t learn SQL SERVER from begining. I did my bachelors from gujarat university and my background is B.COM but i am very good in computer. and english language. please advise me. Pinal Great interview. I love all the Q & A especially the 3 rd one. Today only i read this post. Thanks Michael for the great interview.